Club Marine Palace & Suites combines the best of Greek hospitality and services with traditional Cretan life in a spectacular seaside setting next to the idyllic fishing village of Panormo. 50 brand new guest rooms around the existing 6.000m² Aqua Park and new look in guestrooms & suites offer the best feeling combining all the services of an all-inclusive resort with the convenience of a fully equipped second home. Take advantage of our best special offers and benefits. Book now and save more for your ideal family holiday escape. This mega-waterpark, the largest in a Greek resort, is a whirling 6.000m² of excitement, filled with heart stopping, adrenaline pumping, record breaking aqua towers, rides and waterslides. The ultimate experience for the whole family in absolute safety. Unlimited dining options with a selection of 12 restaurants and bars to match your mood - from a family meal to an evening with friends al fresco or an intimate dinner. Take your pick and it’s all for free! A holiday for all! Designed with families in mind the resort features an abundance of facilities and programmes. Kids can enjoy play-filled days of laughter, splashing around in swimsuits and sun hats. 50 brand new guest rooms, new look in guestrooms & suites, amazing Aqua Park – Kingdom of Poseidon and a lot more to discover this summer at your beloved Cretan resort. The Elixir ThalassoSpa comes with a real thalassotherapy pool, a pyramid-shaped glass roof and a big Jacuzzi. Right in the middle of the resort, it offers fully equipped gym, sauna, steam room and personalized treatments. Something for everyone! A family and sport friendly resort with an abundance of choices, there is a host of activities from morning to night including a new fantastic Aqua Park – Kingdom of Poseidon and the best underwater diving in Crete. A true aqua land! The resort lies in a Blue Flag awarded sandy bay with two creeks. It features an amazing aqua park, 3 freshwater pools, seawater pool, heated seawater Thalasso pool & paddling pool. 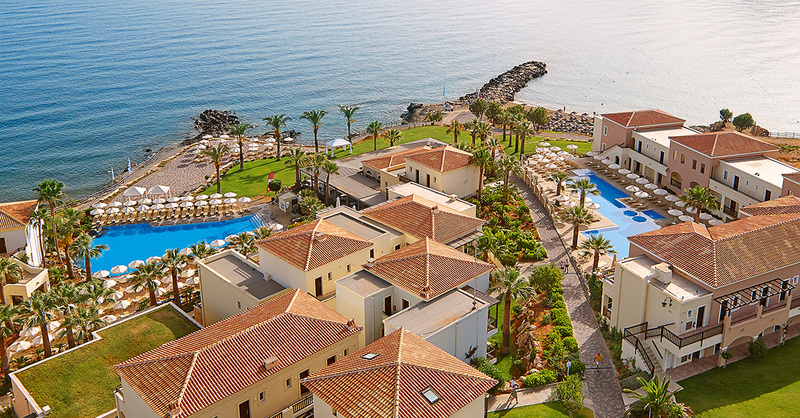 Grecotel enhances your Cretan experience with dazzling resorts, delicious world-famous cuisine, pristine nature and deep rooted traditional values. Don’t miss a visit to the Agreco, Grecotel’s own traditional Cretan Farm. From fine dining to amazing experiences of a lifetime designed to make your holiday fantasy real. Let your rewarded journey begin.